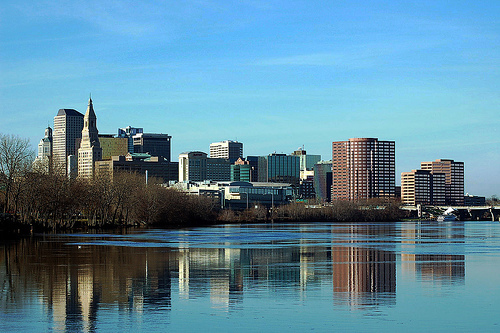 Hartford, Connecticut, is the capital of the state, with over 100,000 people. Its nickname is the “Insurance Capital of the World,” as a few major insurance companies are headquartered there. It is one of the oldest cities in the country with several historic sites, and its downtown area is undergoing revitalization. Though there are not many dog-friendly activities in the city proper, the surrounding suburbs offer many great outdoor hiking, dining and shopping opportunities, as well as off-leash dog parks. Talcott Mountain is a 557 acre state park that is located in Bloomfield, Connecticut. There is a nice 1.5 mile hike that humans and leashed dogs can walk, where they can reach Heublein Tower and get a beautiful view of the Farmington River Valley. This park also has a picnic shelter and restrooms. Dogs are not allowed to enter any of the buildings, but are free to roam outdoors. The Metacomet-Monadock Trail can be accessed through Rising Corner Road in West Suffield, Connecticut. It is a very long trail that goes from Connecticut to New Hampshire, and is maintained by the Appalachian Mountain Club. If you plan on going far on this trail, it is recommended to buy a book or map. Leashed dogs are allowed to hike on this trail with their owners. Granby Dog Park is a fenced-in, off-leash area for dogs in the greater Salmon Brook Park in Granby, Connecticut. This park is run by volunteers, but is open to the public. They sometimes hold dog events in the park as well. 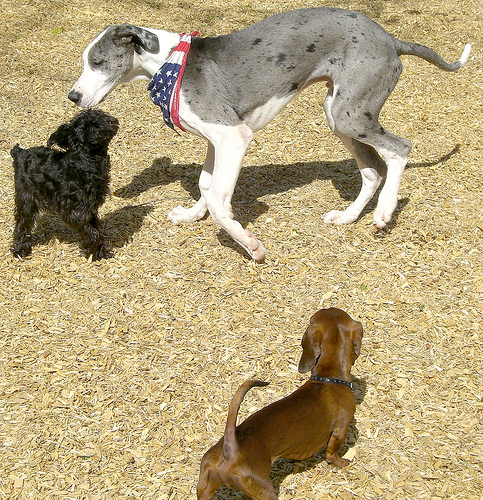 Make sure to follow the Granby Dog Park Rules. Wethersfield Dog Park is located in the greater Mill Woods Park in Wethersfield, Connecticut. It is one acre of fenced-in space where dogs are allowed to run without leashes. It is divided into large and small dog areas, and there are also picnic tables, benches, waste bags, garbage cans, watering stations and message boards. People who bring their dogs to this park should make sure to follow its rules. They also throw seasonal events. This shopping center is located in South Windsor, Connecticut. Leashed dogs, or carried small dogs, are welcome to be in the common areas of this mall, as well as many of the listed stores and restaurants. Located in West Hartford, Elbow Room serves American style foods, beers and wines. Leashed dogs may sit at the outdoor tables. Murasaki is a Japanese restaurant in West Hartford, and they serve an assortment of sushi, meats and vegetarian options. Leashed dogs may sit outside with their owners.